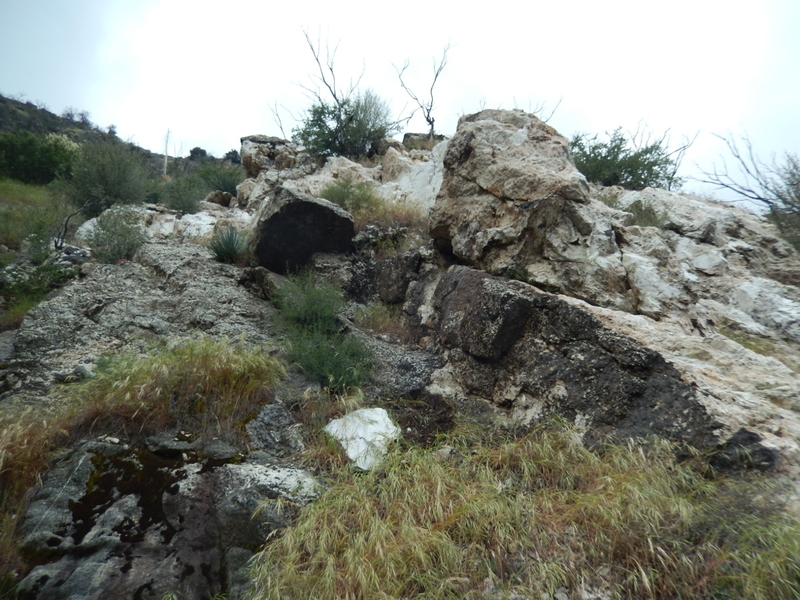 The Pacoima Canyon pegmatite is a legendary mineral locality. It boasts some of the finest allanite crystals in the world, as well as unusually large zircon crystals, huge crystalline biotite clots, gigantic hornblende crystals (some up to several feet long), and abundant massive pink potassium feldspar crystals. Getting to the pegmatite is a bit of an adventure. The Pacoima Canyon road, which once followed the canyon streambed from nearby paved roads and which provided relatively simple (although not necessarily easy, as there were apparently more than 50 stream crosses) access to the locality, was decommissioned more than twenty years ago. Parts of the road are still navigable on foot, but for the most part the road has been reclaimed by vegetation and landscape alteration. 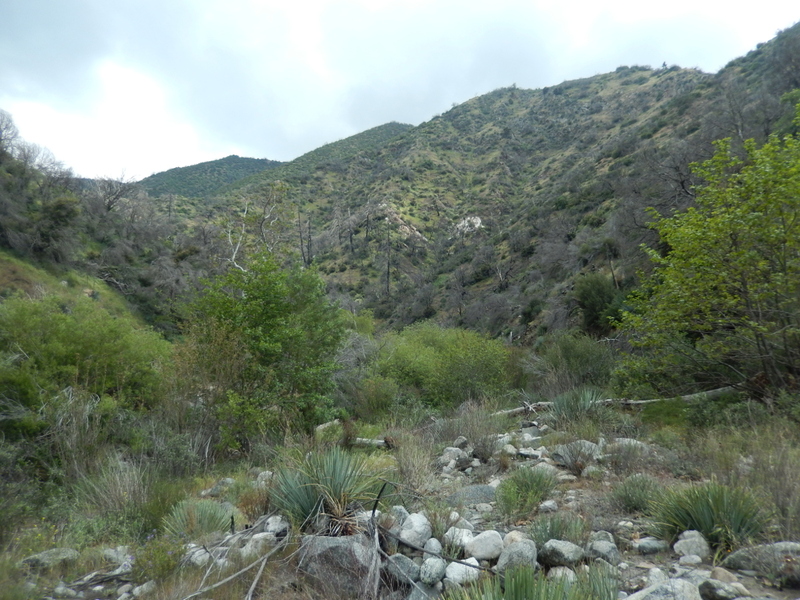 Traveling through Pacoima Canyon proper is therefore a true cross-country bushwhacking adventure. Beyond the difficulties of travel through Pacoima Canyon itself, many of the roads in this part of the Angeles National Forest remain closed after the devastating Station Fire of 2009. 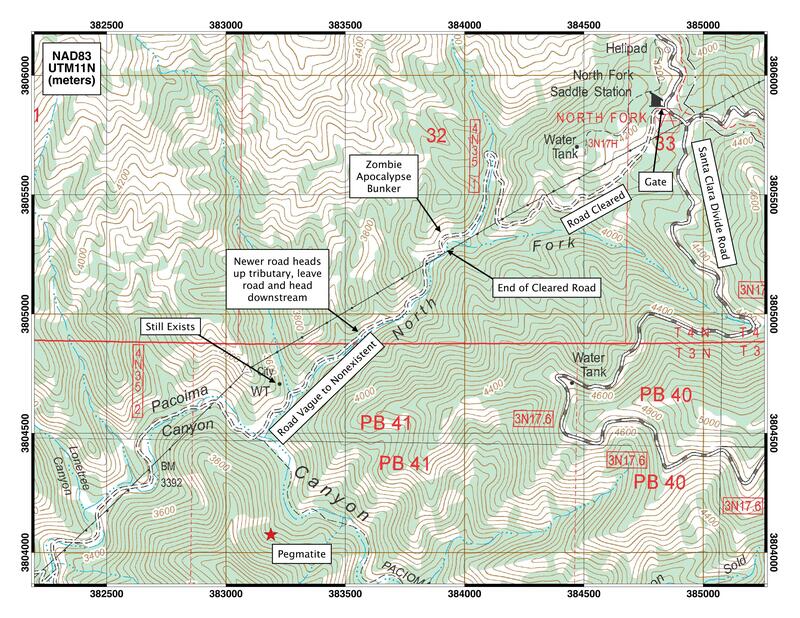 (Public access to this portion of the National Forest was restored in 2014, but many roads, including the Santa Clara Divide Road, remain closed due to their poor condition.) Getting to the North Fork Saddle Ranger Station and Picnic Area, which provides the easiest access to the pegmatite locality, therefore requires many miles of non-motorized travel. The pegmatite is rather heterogeneous, so some areas are better for zircon and allanite than others. 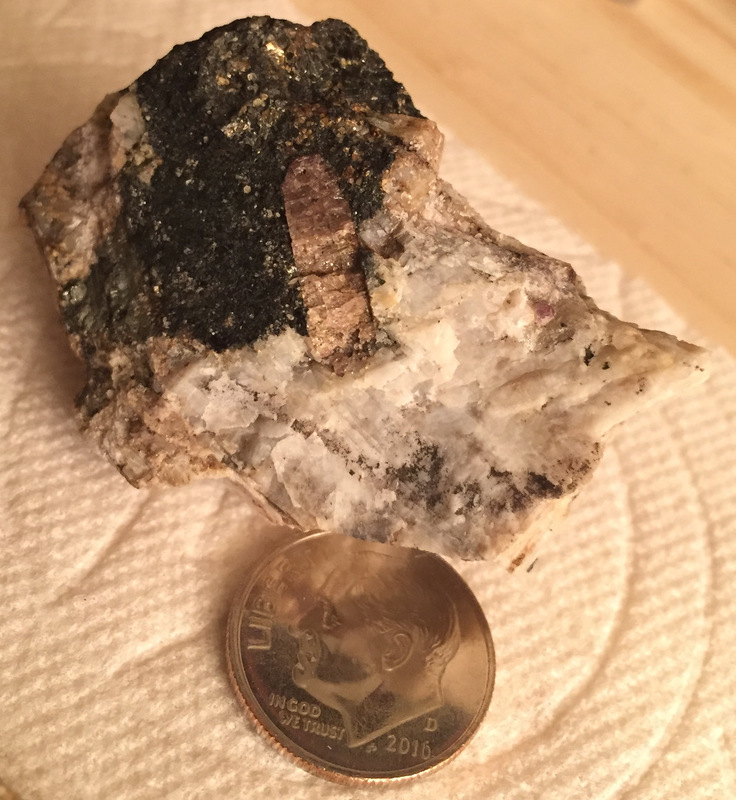 (The article by Patchick, referenced below, provides a good discussion of the different parts of the pegmatite.) 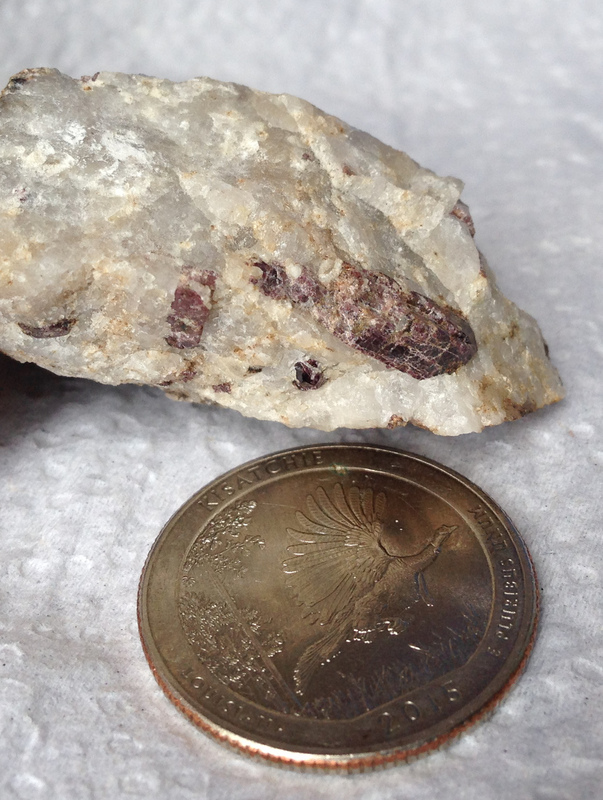 The coordinates above were taken at a zircon- and allanite-rich portion of the pegmatite. The allanite crystals are black rectangular prisms up to several centimeters in length. The zircon crystals range in color from lavender to reddish brown and are generally a few millimeters long (although some crystals reach several centimeters in length). The zircons are generally broken and crumbling on exposed surfaces, but nice terminations can be found on freshly exposed surfaces. 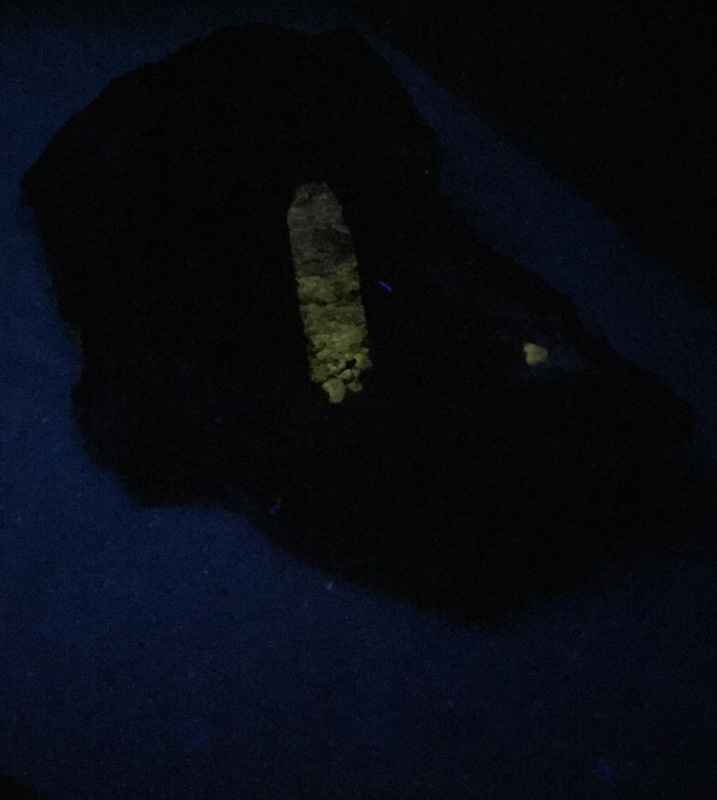 The best strategy for finding zircons is to look closely at the outcrop for hints of the mineral and then break open any suspect rocks to expose the interior crystals. The pegmatite is very hard, so come prepared with a good hammer. 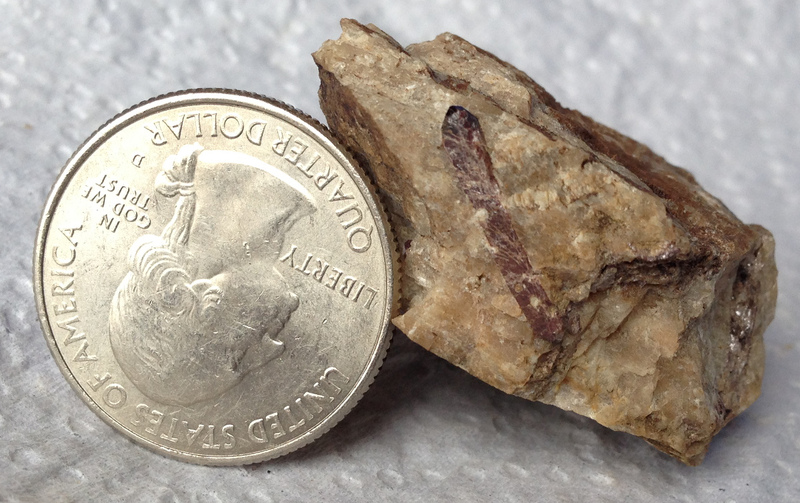 We found good crystals in the small recess on the side of the outcrop that is shown in the picture below. 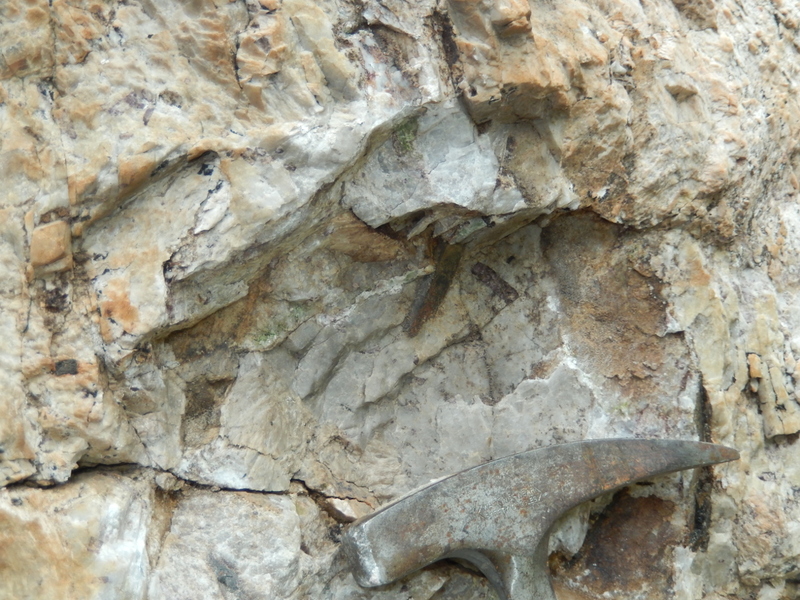 We also found large zircons in a small, blocky outcrop about fifty feet directly downhill from this spot. Accessing the pegmatite is non-trivial, but a visit to this locality is definitely worth the trip. Some readers might find the closure of roads in the Western San Gabriel Mountains to be rather annoying. Reopening the Santa Clara Divide Road to motorized traffic would make access easier, but it would also almost certainly be detrimental to the area. Just look at how utterly trashed and abused the Bear Divide area currently is. Many patrons of the Angeles National Forest seem to have no respect for their surroundings, and allowing motorized traffic back into the upper reaches of Pacoima Canyon would just allow that disrespect and abuse to spread to those areas as well. Keeping the Santa Clara Divide Road closed to motorized traffic would preserve the solitude and beauty of this portion of the Western San Gabriels. Besides, the adventure associated with getting to this locality is a significant portion of the fun. Minerals of the Pacoima Pegmatite, Los Angeles County, California, W.P. Moller, Rocks & Minerals, 1995. Remarkable Occurrence of Allanite and Zircon Crystals from a Southern California Pegmatite, P.F. Patchick, Rocks & Minerals, 1955. Allanite Pegmatite, San Gabriel Mountains, Los Angeles County, California, G.J. Neuerburg, American Mineralogist, 1954.